Drop earrings by Oscar de la Renta. 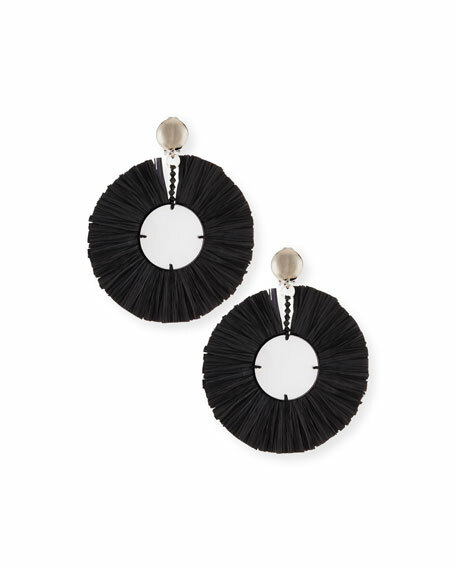 EXCLUSIVELY AT NEIMAN MARCUS Rainbow statement earrings by Lulu Frost. Polished yellow golden hardware and posts. Prong-set round rainbow-colored Swarovsk? ?i crystals. Round post with three rainbow dangles. Post backs for pierced ears. Imported. Painted disc earrings by Oscar de la Renta. Painted resin over pewter and brass. Profile motif at bottle cap drops. Painted disc earrings by Oscar de la Renta. Painted resin over pewter and brass. Profile motif at bottle cap drops. Post backs for pierced ears. Approx. 2"L drop; 1"W. Imported. Oscar de la Renta shell turtle earrings. Polished silvertone turtle silhouettes. Swarovski?? crystal posts and details. Turtle drop with twisted lattice shell. Oval-shaped mother-of-pearl back. Clip-on backs. Approx. 3.3"L drop; 1.8"W. Made in USA.